Welcome to the Many New Observers! We are into the depths of spring. In particular, March has been over for a few weeks now. And, March brought some good news for Florida CoCoRaHS. As announced in the last newsletter sent out in late January, an observer-recruitment push known as March Madness was last month. March Madness pitted the 50 states against each other to have the greatest recruitment during March. Recruitment was measured in two different ways: one, by the absolute number of new observers without respect to population, and two, by the number of new observers relative to the total population of the state. In Florida, 135 new observers joined, which was good enough to be the highest absolute number of all the states, earning us one of the "CoCoRaHS Cups", shown below. Wyoming was able to bring on board 44.36 new observers per million people living there, which allowed them to win in the population-relative category. We'd like to give a hearty welcome to the many new observers and to thank everyone who had a hand in promoting CoCoRaHS during March (and all the rest of the time, for that matter). For the newer observers reading this, we'd like to introduce ourselves as your state co-coordinators. Ivetta Abramyan is a professor of earth sciences at the Florida State College at Jacksonville, and she previously helped coordinate CoCoRaHS in South Carolina in the state climate office at the University of South Carolina in Columbia. Danny Brouillette is a climatologist at the Florida Climate Center (Florida's state climate office) at the Florida State University in Tallahassee, having been an observer and county coordinator in DeKalb and Kane counties, northern Illinois, in the late 2000's and early 2010's. Additionally, the state is divided into seven regions (see here). Each region has one or two coordinators who are meteorologists at the local National Weather Service office. These regional coordinators, with the help of local coordinators in some counties, should be a point of first contact for questions or concerns. They will also be on the look-out for typos in or other problems with your observations and may contact you by e-mail for clarification. It will be very much appreciated if you could respond timely to these queries for clarification. Maintaining the quality of your observations only makes them more valuable! In this newsletter, we provide some tips for new observers (and reminders for the seasoned ones), a briefing on the drought and wildfire situation across the state, a selection of comments that you have given with your daily reports, photos of your rain gauges that you have sent us, and more. 1. Use the official 4" rain gauge - To ensure consistency among observations, it is required that all observers use the official 4" rain gauge (shown below), which can be purchased online from Weather Your Way or Scientific Sales, Inc.
2. Report zeroes - More than occasionally, you will find that no rain has fallen when you make your observation. Please report that, in fact, no rain has fallen: zeroes are important! Users of your data cannot know that no rain has fallen if you do not report that by entering zero. Knowing that no rain has fallen, especially over a period of time, is important for climatologists and hydrologists to diagnose drought, for instance. 3. Enter Multi-Day Accumulation reports as needed - Instances will arise when you are unable to make daily observations for a period of time, such as when you are away from home on vacation. And, that's fine, but you will need to enter a Multi-Day Accumulation report to enter observations of rainfall that occurred over a period greater than 24 hours. More information is given about these reports in the training materials. 4. Dew is not precipitation - Heavy dew is a common visitor to Florida. Sometimes, as a result, dew, or condensation, will collect in gauges to an extent that it will register as a trace or 0.01" or sometimes more. This is NOT precipitation and should not be reported as such. Please remember that you are measuring precipitation, not condensation. If such heavy condensation happens and you are reasonably sure that no rain fell, please enter the total as zero. Including a comment with your observation is always helpful in these instances. 5. 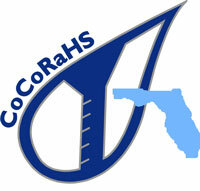 "Like" our Facebook page - Florida CoCoRaHS has a page on Facebook. If you are on Facebook, feel free to "like" that page, which is found here. We frequently post news and other information on that page. Observer comments are encouraged! Comments add context to your observations, which can be very helpful, and they can be just fun to read. Here are some that have caught our eye recently. 8 February 2017, Auburndale 1.1W, Polk County (PK-50): "Partly cloudy at time of observation. About .05" fell as part of a small thunderstorm yesterday afternoon, and the rest was all from the squall line last night. In addition to a nice round of much-needed rain, it apparently brought some hefty winds; numerous small twigs & branches down, plus some trash (pickup day today) blown about, including a mysteriously vanished large empty plastic bag from our can!" 8 February 2017, Gainesville 1.7SE, Alachua County (AL-26): "Thunderstorm at 9:50 p.m. 2/7/2017 lasting about 1/2 hr, followed by lighter rain still occurring at 1:00 a.m. During the storm, there was a brief time when it sounded like spits of ice or hail might be blowing against the house, but it wasn't visible in the dark." 3 March 2017, Ormond Beach 3.5SE, Volusia County (VL-5): "Afternoon showers before and during cold front passage gave 0.16 inches." 4 April 2017, Live Oak 0.4NE, Suwannee County (SW-1): " Good soaking rain lasted many, many hours. Lightning and thunder were almost non-stop. These series of cells started moving through at 9:15 p.m. and didn't stop until 7:30 a.m. this morning. The cells were electrically intense. If these had hit us during the daytime with the heating of the day, we could easily have been in trouble. It sounded like there was sleet mixed in with the rain after 2 a.m. There was no wind once the sun went down. It had been very breezy during the afternoon. The wind readings say the highest the wind got was 24 miles an hour, but it only reads every 15 minutes, and a lot of readings get missed due to this reading technique." 4 April 2017, Gainesville 5.4W, Alachua County (AL-48): "No trace in gauge. Raindrops on cars." We encourage you to send along photos of your rain-gauge set-ups and any interesting weather that you see. In the past few weeks, we've received several rain-gauge photos. This photo came to us from Donald Stanton, who observes 7.0 miles northwest of Ocala in Marion County (MR-61). Cynthia Voorhees's gauge is mounted to a fence post at her location 12 miles west of Century in Escambia County in the western Panhandle (ES-39). Evelyn Arteaga shows off her gauge at her home in the Hammocks in Miami-Dade County (MD-68). Nora Quinlan has recently installed a gauge in her driveway swale at her home 11 miles northwest of Hollywood, Broward County (BW-110). Vic Danart sent us this photo of his gauge at his home just outside Wacissa in Jefferson County (JF-3). The period from October to May forms the core of the annual dry season on most of the Florida peninsula, while the area north and west of approximately Gainesville has a secondary wet season. However, this year's dry season on the peninsula has been much drier than a typical one as shown below in the map of rainfall departures from normal since 1 October. In some places in south Florida, rainfall in the last six months has been only one-quarter of normal. Correspondingly, drought has developed in a large section of central and south Florida. Below is the latest issue of the US Drought Monitor. Significantly, as the peak of Florida's wildfire season approaches in May, this drought has resulted in increasingly favorable conditions for wildfires to initiate and spread. The number of wildfires and the number of acres burned by wildfires has much exceeded average. Conditions are likely to get worse before they get better, when the summer rainy season begins in late May and early June, leading Governor Rick Scott to issue an emergency declaration to expedite government response to wildfires. Additionally, the St. Johns River Water Management District and South Florida Water Management District have issued orders for water conservation in fears of possible water shortages.